Hydroflow water treatment. Distributor in Russia web site. | Гидрофлоу - ферритные приборы для защиты от жесткой воды, накипи, коррозии. Водоподготовка. Официальный сайт.Гидрофлоу — ферритные приборы для защиты от жесткой воды, накипи, коррозии. Водоподготовка. Официальный сайт. Let us introduce you Hydroflow - New generation water treatment system. High-efficiency patented technology is based on an innovative physicochemical solution. Work of electromagnetic impulses with variable frequency is used to create in the pipe the secondary field with "standing wave" effect, which is produced by the high-frequency generator. The field deters deposit growth by preventing ions of salt from depositing on pipe surfaces. In the form of suspended microcrystals they flush away from the system. The same effect gradually removes old deposits as well. 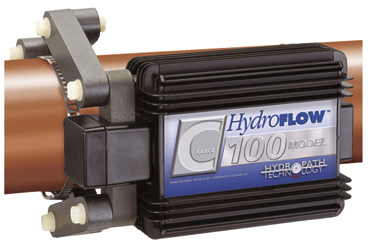 Hydroflow efficiency is in 10-12 times higher than older systems. Hydroflow effectively replace the costly method of chemical water treatment, helping companies to save a lot of money. Company can decrease operational costs (reagents, regeneration, utilization, upkeep of personnel, and so on), and this provides the greatest economic effect and quick payback of Hydroflow at a very high functional efficiency. The system is characterized by simplicity of installation and minimal operating costs. More than 500'000 of customers in 35 countries of the world trusted Hydroflow to protect their pipes, boilers, heat exchangers and other assemblies. Hydroflow is used by such companies as Coca Cola, NASA, Nestle, Honda, Panasonic, Michelin, Kawasaki, British Gas, Lockheed Martin Space Operations, and many others. plus their modifications for domestic use. Hydroflow is manufactured in Great Britain by Hydropath Holdings Ltd. The company use quality management system ISO 9001:2000. All parts pass intermediate stages of control during manufacturing, and then each ready product is tested during 24 hours. All products have international certificates of safety. Our company, Gidroflou LLC, represents Hydropath in Russia and former USSR countries. We provide the full range of services from solution development and implementation to customer support.